Headline inflation has broken out to the upside, breaching the 4% year on year level, in the latest inflation index for annual and monthly inflation. Annual inflation for July 2018 compared to July 2017, now stands at 4.5%, consistently rising since April this year. 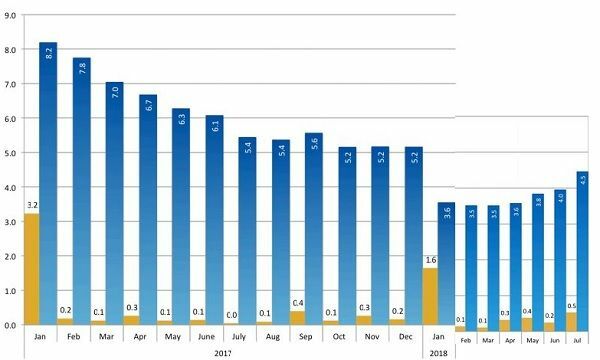 Monthly inflation from June 2018 to July 2018, has more than doubled, effectively growing by a factor of 2.5 . Although the Statistician General, Mr Alex Shimuafeni tried to downplay the shocking inflation figures by reminding users of statistics that the year on year monthly growth is still less than the same month a year ago, he failed to notice that headline inflation has now manifested a clear trend since April, and that trend is up. However, month on month inflation is the real shocker, jumping from 0.2% to 0.5%. That is a 150% acceleration. The reason why this year’s July inflation is lower than last year’s is because of a decrease of 5% in the prices of Clothing & Footwear, slower growth of 3.7% in the prices of Housing, Water, Electricity, Gas and Other Fuels (9.1% in July 2017), slower growth of 0.6% in the prices of Furnishings, Household Equipment and Routine Maintenance (4.1% in July 2017), slower growth of 0.3% in the prices of Communication (3.5% in July 2017), and finally, slower growth of 3.1% in the prices of Recreation & Culture (4.9% in July 2017). The twelve-month average annual and average monthly inflation rate for the period August 2017 to July 2018 stood at 4.4% and 0.4% respectively, while the 2018 year-to-date average is estimated at 3.8%.